The Kardashians have come a long way from hosting cheesy birthday parties at Tao. Now that they're one of the richest families in the world, with Kylie Jenner on track to being the family's first billionaire, they go all out when it comes to celebrating turning one year older. But aside from their celebrity-filled dinners at exclusive clubs or expensive dinners with clever themes (who can forget Kris Jenner's Great Gatsby party? ), the Kardashians love renting. And we're not just talking about an event space or a large party venue, we're talking about renting out an entire Six Flags. And if that sounds insane, the famous flock has spent millions on birthdays that were even more ridiculous. Below, the most extravagant places the Kardashians rented for their birthdays, from least expensive to most. When they rented out a movie theater for Kris' birthday. We're starting off this list with the least extravagant birthday rental. For her 61st birthday, the momager already had a glitzy, celebrity-filled dinner at Catch LA in West Hollywood, but the next day, Khloé and Kylie decided to treat mom to a private screening of the movie Trolls. 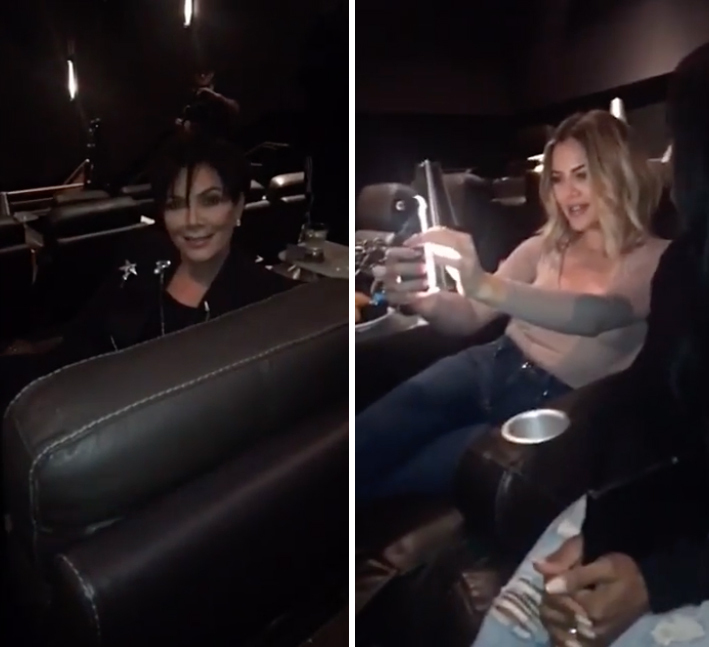 Although, judging by their Snapchat videos, the three mostly just took selfies instead of watching the movie. They also treated mom to a neck massage during the screening. Not much of a "party" but a pretty extravagant gesture for an otherwise laidback post-birthday get-together. When they rented out an entire Dave & Buster's for Khloé's birthday. In 2016, Khloé decided to have an arcade-themed party for her 32nd birthday and rented out an entire Dave & Buster's to make room for the entire Kardashian clan, even including Rob and Blac Chyna (in happier days). Considering it costs about $20,000 to rent out the space for three hours, the party was downright economical for the family's usual budget. When Kanye rented an entire theater for Kim's birthday. Leave it up to Kanye to up the ante when it comes to birthdays. Instead of just renting one auditorium, he rented out all of Cinepolis Luxury Cinemas in Westlake Village, CA for Kim's 35th, showing her a private screening of Steve Jobs and then hosting a pregnancy-themed bash afterward. We're not sure how much this one cost, but we're sure Kanye spent a hefty penny on just the cake alone. When Kim rented out the Staples Center for Kanye's birthday. For his 40th, the controversial rapper was treated to every boy's dream — an opportunity to play basketball just like the pros. Kim invited all kinds of celebrity friends (Justin Bieber was there for some reason) and the two battled it out with a real referee and were cheered on by real Lakers cheerleaders. As for the price, Kim rented the space for a whopping $110,000. When Kim rented an entire island for Kanye's birthday. After you rent out the Staples Center and every movie theater in LA, there's pretty much nowhere to go but on a deserted island somewhere. That's what Kanye did for his 40th birthday. The couple stayed for four days at Baker’s Bay Golf and Ocean Club where they had the whole island to themselves. They also had four private planes they rented to fly out their closest friends. The whole thing cost about $440,000. When Kylie rented an entire Six Flags for Travis Scott's birthday. When Kylie's baby daddy turned 26, she took the whole squad to Six Flags Magic Mountain and rented out the whole thing. Her reasoning for such an extravagant birthday purchase? "They’ve never been," she wrote on Snapchat. Although we don't know how much she paid, according to reports, she might've paid $100,000 an hour or $1 million for the whole day. Either way, whatever she paid, it was definitely in the millions. When the whole family rented Six Flags for Kendall's birthday, too. So apparently this family just loves renting Six Flags. For Kendall's 18th birthday, the family rented out the whole space for her and filled it with weird celebrity guests, like Jaden Smith and even Blac Chyna's mother, Tokyo Toni. This was back when Kim and Blac Chyna were on friendlier terms, obviously. When Kylie rented an entire resort for her 19th birthday. For her 19th, Kylie flew out to Turks & Caicos with her squad of friends. She rented out not one but three beachside villas that were all large enough to hold about 18 people each. While on the island, guests were treated to a personal chef, butler, a tennis court, a gym, and a waterfall. The cost of her six-acreage rental? $35 million. And she wasn't even old enough to drink!